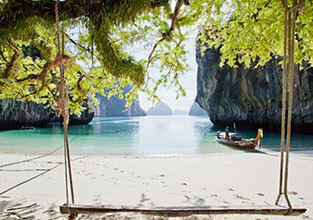 Krabi is a province where is seaside of Andaman Sea. It consists of mountain and 154 archipelagos. This area is mangrove forest. Headwater of river is on Panom Bencha Mountain flow pass Krabi to Andaman Sea. Thale Waek, Famous attraction place for tourists of Krabi which has given name “Unseen Thailand”. The worder of nature when low tide, sea swash grain of sand to this area became phenomenon is called “Thale Waek”. Thale Waek make sand bar to connect 3 islands (Koh Kai, Koh Mor, Koh Tub) and when flood tide, grain of sand is drown. Although you go to Krabi in period of low tide, you cannot see “Thale Waek” but you can go pass among 3 islands. Koh Hong is big island in Pa Koh, Highlight of this island is different from other island because the nature of front island is semicircle. The forest covers back of island. The sea is turquoise color. Every March, This Island is area for crowd small fish. 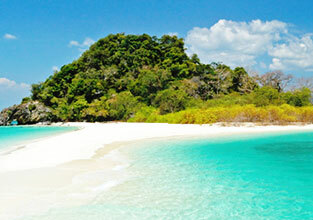 Hong Islands is archipelago consist of many island such as Koh Lao or Koh Saga, Koh Lao Ream, Koh Pak Ka and etc. The nature of Koh Hong is limestones, clear sea and white beach. 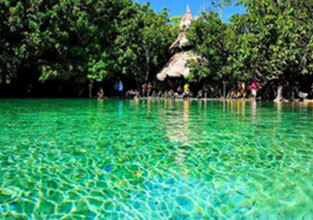 You can see reef, recommend you for activity such as diving, canoeing and camping. This place has trails for learning natural.